Questions about the amount of sales tax collected by the Rams in ticket prices have led to contested tax assessments. 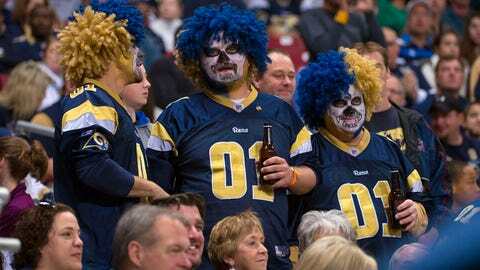 ST. LOUIS (AP) Attorneys for the St. Louis Rams have filed a tax appeal with the state of Missouri, seeking a refund of about $400,000. The Rams have contested tax assessments before — they’ve filed six appeals since 2008, amounting to $4.7 million at face value. The Post-Dispatch reported that the appeals began after a state audit in September 2008, when the Rams were told that the team owed nearly $1.4 million in unpaid taxes on luxury club memberships. The Rams protested that assessment — the first of the six appeals. "Some people are just a little more aggressive in trying to diminish their state tax bills," said Henry Ordower, a tax law professor at Saint Louis University. He said appeals have been more common in recent years because states have sought ways to increase their tax collection. "Every state has been more assertive in collecting state taxes," Ordower said. "States need money." The team also sells something called a "club membership." Club memberships add $1,000 on top of the ticket price, and members get food and beverage discounts, entry to draft previews, training camp practices and special events, and other benefits. In the other appeals, the team argued it is not subject to state sales tax at all. Then in 2011, the Rams said they discovered they were "erroneously" calculating sales taxes on a base ticket price inflated by the city taxes. That means the city was collecting about 40 cents too much on each $100 ticket.